Your backyard is maxed out. Last year you pulled up your lawn to plant potatoes but it still just isn’t enough. It’s time to attack the planting strip. This often ignored patch has a lot going for it; it usually gets full sun, it’s a good way to meet your neighbors, you can sneak in some gardening on the way to and from the car, it can help with stormwater run off and it can actuallycalm traffic by creating a good reason for people to slow down. However, it’s not all sweet peas and happiness. “That man had a bucket and he was just stripping your cherry tomatoes” reported an elderly neighbor a few years back. On another balmy day I looked out my kitchen window and saw a dog owner cheerfully let his pet lift his leg on each and every bed as they made their way down the sidewalk. But hey, it’s land isn’t it? Oddly enough even though you are responsible for keeping it looking good you don’t actually own your parking strip; the city does. Because of this there are regulations you need to follow when planting such as set-backs from the sidewalk and height restrictions. There are also good neighbor things such as planting things that look nice and don’t block sight lines. To learn more about these regulation and apply for a free permit visit here. 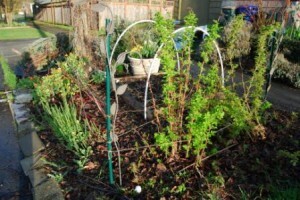 You can plant in neat raised bed or go wild and cultivate the whole strip. If you go this route be sure to test your soil and know things might get dug up if the city needs to put in something like a new light pole. You could also get ticketed for not observing the proper set back if you plant up to the street or sidewalk edge.